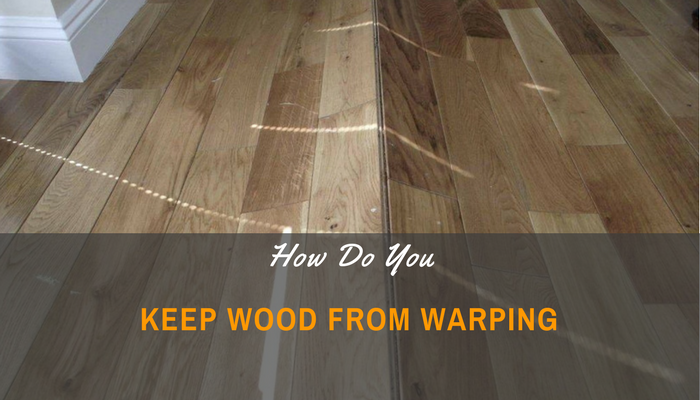 →How Do You Keep Wood from Warping? It doesn't matter if you are a hobbyist or if you work with wood for a living, one of the more frustrating problems that you may experience is when the wood warps. It can really ruin a project and sometimes, it may even ruin the wood prior to the time that you begin working with it. This leaves many people wondering why wood warps in the first place and what they can do in order to prevent it from occurring. More than likely, you have already heard about the possibility that moisture or levels of humidity could have an impact on the integrity as well as the shape of the wood. When it comes to making certain types of projects, including furniture or perhaps working with custom cabinetry, any type of warping can be problematic. In some cases, it can even be dangerous, as is the case when you're using wood as a building material for a structure. Before we begin talking about how to prevent wood warping, it's a good idea to understand what is taking place under the surface. In essence, anytime wood warps it is a deformity that takes place when there are different levels of moisture content inside of the piece of wood. As a result of variations of the moisture, one area of the board is going to dry more quickly than other areas and in turn, that area is also going to shrink more quickly. The resultant stress that it puts on the rest of the board causes it to bend and, at that point, you have warping taking place. Something else that needs to be understood is equilibrium in moisture. There is moisture in the world all around us. It is in all living things and it is also in the air around us as well. When wood has a higher moisture content, it is going to dry over the course of time and eventually, it is going to reach a balance with the relative humidity. On the other hand, if the wood is drier than the surrounding air, it is going to absorb moisture from it and swell. This process can also be influenced by external factors, including the orientation of the grain, the size of the wood, the temperature in the air around the wood and any coating that may be on the wood. Something else that needs to be considered is that not all wood warps in the same way. 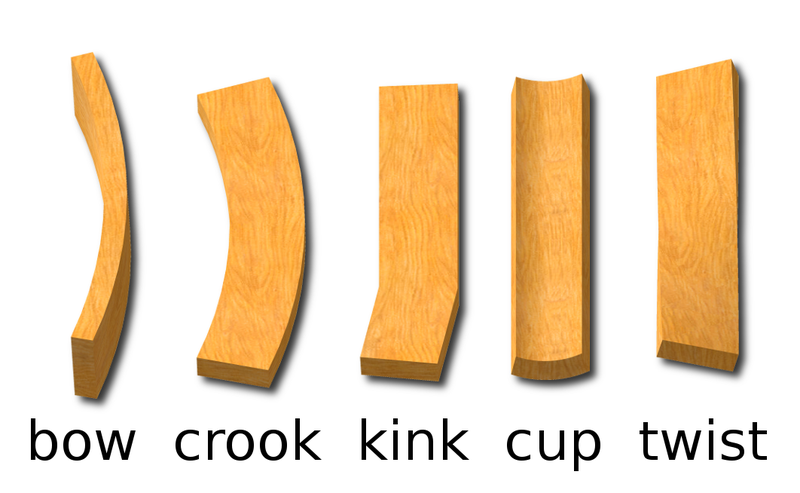 In fact, there are 5 different types of wood warping that may be seen and each of these will occur for a very specific reason. The following 5 types of warping may occur. Bow - This is the most common type of warping and it occurs when the lumber warps lengthwise but not widthwise. Crook - When the warping occurs along a single edge of the lumber, this is known as a crook. Kink - This type of warping takes place at a specific area on the board. Cup - This is when lumber deviates in a rounded fashion across the width. Twist - When wood warps and it causes the four corners to turn, it will no longer be on a flat plane. There are a number of considerations to keep wood from warping and one of those is to choose a type of wood that is less resistant to this problem. As long as the building project allows for it, you may want to choose cedar, redwood or fir. These types of wood are less likely to warp for different reasons, including their density, moisture stability and the grain pattern. You can also learn a lot about the wood that you are using and the possibility for warping by studying the grain pattern. The grain patterns result from the area of the tree that the wood is cut from. When wood comes from closer to the heart of the tree, it is typically going to withstand various pressures that could lead to warping. In addition, if you can find wood with very straight grain lines, it is going to be less likely to have a problem with warping as well. When storing wood, there are certain things that you can do to help reduce the possibility for warping. One thing that you want to ensure is that all boards and any stacking boards that are put between them should be of the same thickness. When stickers are used, they should be aligned vertically and lay flat. In addition, the foundation where the boards are stacked should be flat as well. Weights can be added to a pile of lumber in order to prevent the lumber from cupping. When the wood is cured and dried properly, the possibility of warping may also be reduced considerably. In many cases, kiln dried lumber is going to be a better choice. If you don't use a kiln, you should try to avoid drying the lumber too slowly and don't allow it to regain moisture content too quickly. In addition, drying the lumber too much could result in other problems, including splitting and cracking. When working with wood, it is always a good idea to inspect it regularly. This is not only true to look for warping, you should also use a hydrometer to measure relative humidity and a tool to measure the moisture content of the wood itself. Although wood warping is relatively common, it does not need to be a problem in every instance. When you dry the wood properly, store it properly and handle it properly during the building process, the possibility of warping is greatly reduced. It may occur from time to time, but limiting the possibility can go a long way in helping you to have a more successful building project.